This winter has been especially frightful. I can’t even begin to image what it has been like for people living in the midwest or northeast who have been utterly beaten down with snow. I survived Snomageddon 2010 and know the misery that comes when the forecast calls for accumulations measured in feet instead of inches. Y’all have my sympathies. While I can’t personally help you dig out from Snowpocalypse 2011, I can offer you a recipe that will have you imagining a land of picnics and potlucks, warm breezes and sunny skies, and flip flops and halter tops. Don’t forget to take along some imaginary sunscreen. BAH Note: If you showed up to a potluck at my house with this dish, you would earn a special place in my heart. I kept tweaking the dressing because the lemons I used were extremely sour. I had to add agave nectar to balance the extreme puckering produced by my produce. Feel free to add a minced clove of garlic to the dressing to turn up the flavor. And if you like your dressing with more olive oil, add it. I purposely scaled the olive oil down to suit my tastes (Pam’s recipes calls for 1/2 cup). BAT Tip: When you cut up the raw shrimp, you want the pieces to be approximately the same size as the scallops so they cook in the same amount of time. And yes, as unconventional as it may seem to cook your seafood with your pasta, it works beautifully. In a small bowl, whisk together the lemon juice, mustard, vinegar, and garlic (if using). Slowly whisk in the olive oil. Taste for seasoning and add salt and pepper to taste. Set the dressing aside. Cook the pasta according to the package directions until it is just al dente, approximately 10 to 12 minutes depending on your pasta. Add the seafood to the pasta pot and cook for one to two minutes until the shrimp and scallops are just cooked and opaque. Drain the pasta and seafood without rinsing and transfer them to a large bowl to cool slightly. Just before serving, mix the tomatoes, feta, and oregano into the bowl with the pasta. Add the dressing and stir to combine. I just might be able to like this if it is served warm. I am not a fan of traditional cold pasta salads, but I am sure Pam has the power to turn me around. Jennifer, this is served warmish so I think you should give it a try…and then imagine that you are eating it on a warm sunny day on the beach. Tracy, I get to enjoy pasta so rarely that when I do, it’s a special occasion. That looks so light and yummy – gonna have to star for a small pitch-in this summer. Brooke, this would be perfect for a summer pot luck. But it’s also quite enjoyable in these cold, not yet spring days. I love anything with scallops. I might try cooking them in a separate pan so they get that nice char and adding them on top of the dish. But either way, this sounds delicious. Jennifer, that would probably work well with larger sea scallops. The ones I used were small bay scallops which cooked super quickly in the pasta water. And yes, it is quite delicious. If you really wanted to get fancy, you could throw in some lump crab into the bowl as well. you are so right with how crappy this winter has been and this pasta dish? such a perfect peek into Spring being just around the corner… hopefully! did i tell you, I’M SO EXCITED TO SEE YOU SATURDAY! Lan, this dish would make quite an impression on date night…hint, hint. I love how the seafood cooks with the pasta–anything that saves the amount of dishes we have to do (no dishwasher over here) is fabulous. And I am dreaming of summer now . . . I can barely imagine leaving the house without a coat, and with bare arms. Is it possible??? Jenna, I give you my word that warmer days are headed our way. Cooking the seafood in the pasta water is amazing and yes, it saves on the number of pots and pans that need to be cleaned up later. I feel for you suffering from Snowpocalypse 2011, well, a little. Seems our ‘normal’ snowfall headed east this year. I’m afraid to say I haven’t missed it because I’m sure that will be the end of our relatively mild winter (cold but not the standard snowfall). I love all things pasta and all things shrimp and scallops. And have this book. What have I been waiting for? Barbara, these last two winters have been brutal. According to my friends that lived in Denver, it would snow like mad but then all be gone in a day or two. I wouldn’t mind it so much if it didn’t take forever to go away once it hit the ground. You have this book? Then I also highly recommend you try the Chicken Pot Pie and Mushroom/Spinach Lasagna. I haven’t tried any of the recipes for sides or desserts yet….needless to say I have quite the supply of untapped recipes on my hands. It’s amazing what a brightly-flavored dish can do for your mood. This would be so good packed in a picnic basket with a chilled bottle of white and enjoyed on the lawn at Wolftrap. Now I just need to pick a show. Oh Ali, that sounds like the perfect setting for Lemony Seafood Pasta Salad. This looks like a lovely salad! I’ll have to make it with just shrimp sometime when my hubby’s not around. He won’t eat shrimp, and I’m not a fan of scallops. 🙂 We are a dysfunctional family! 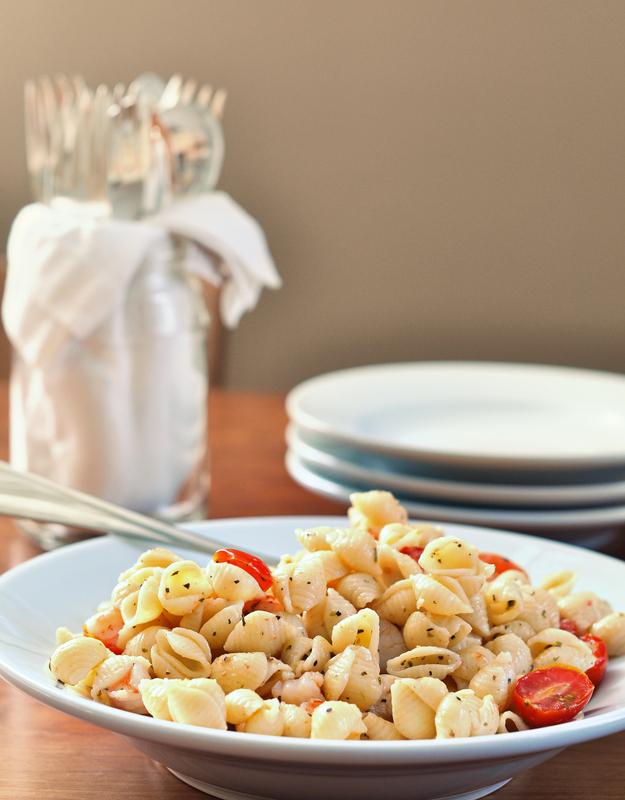 Jen, this pasta salad is the perfect antidote to the winter blahs. If crab or lobster is more your thing, throw some of that into the bowl too. Sounds wonderful! I love pasta warm and cold, so I know I’d like this either way. And I could sure use a reminder of summer! Tracy, this is summer in a bowl. Anna, I hope this dish ends up on your table soon. My friend has a picnic on 4th of July I am looking for a salad to take that does not involve mayonnaise I think this is going to be a #1 hit. when I get out of this hospital I will send you my other recipe for non mayo salad. It is very good and you just makeit the day before so all the flavors can “marry” as they say on FOODTV LOL! Emily, this would be great at a picnic but I would recommend that you find a way to keep it cool because of the shrimp and scallops.